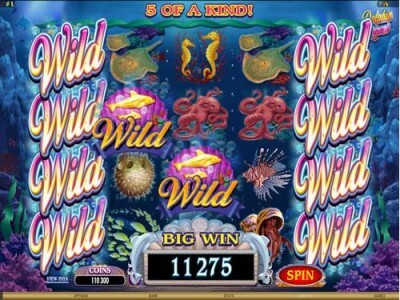 Dolphin Quest online pokies is an underwater adventure game which features creatures from the deep. At the heart of the game is the dolphin and other symbols including Sea Turtle, the Octopus, the Stingrays, the brightly coloured Lionfish, the round spiky Pufferfish, the colourful Seahorse, Goldfish, and the Hermit Crab. These fun fill animations provide real money payouts over 5 reels and 50 paylines. It is easy to spin up a winning combination with the helps of the Wild Symbol which is the Dolphin Quest Logo. This is because it often appears stacked and displays up to 5 wilds on a reel. The Dolphin Quest logo substitutes for all others to increase your payout chances. To hit the bonus you require three of the Golden Dolphin scatter symbols appearing simultaneously on the second, third and fourth reels. The payline will then open up in the centre of three reels, displaying bonus amounts. The reels will then spin presenting a bonus win. The Australian themed Dolphin Quest online pokies is a must try, enjoy the demo game or play real money pokies.